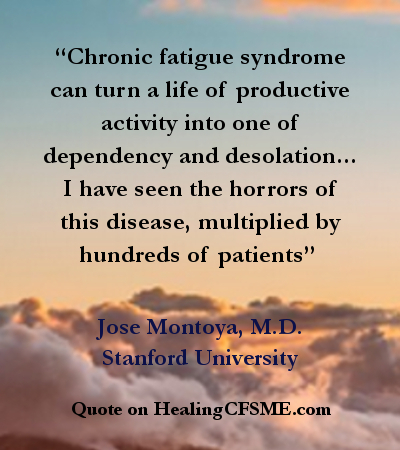 This article shares doctors' quotes about Chronic Fatigue Syndrome aka Myalgic Encephalomyelitis. 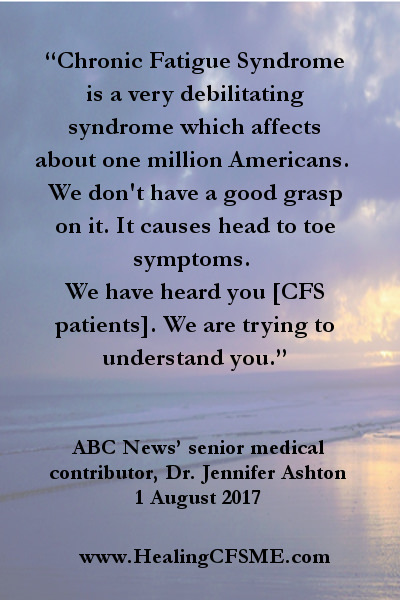 Where there is an image of the CFS quote, the words are included both in the image and the text. 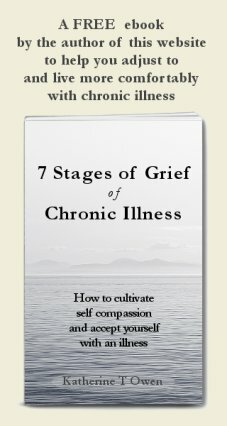 This article and this healing website is written by someone who lives with the chronic illness ME/CFS. “Chronic Fatigue Syndrome is a very debilitating syndrome which affects about one million Americans. We don't have a good grasp on it. It causes head to toe symptoms. 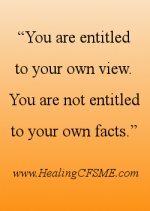 Note from Katherine: I shared the above CFS quote on twitter. I was told that Dr William Reeves hasn't always been the most helpful towards CFS patients. 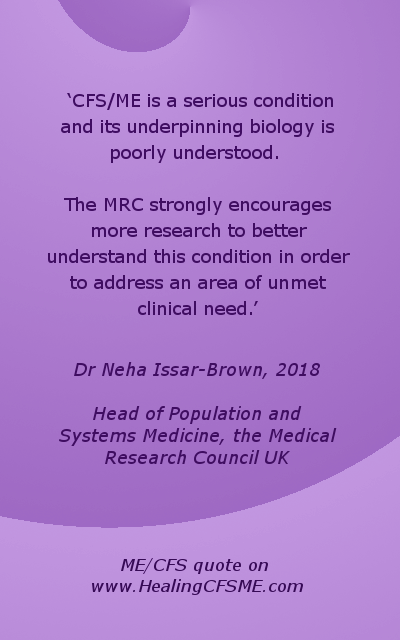 ‘CFS/ME is a serious condition and its underpinning biology is poorly understood. 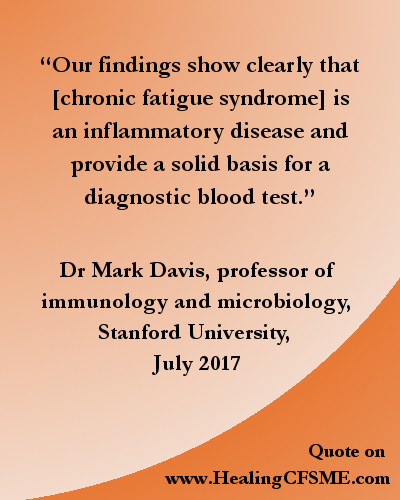 Encouragingly, this work (research published December 2018) sheds light on potential mechanisms of immune dysregulation underlying early stages of chronic fatigue syndrome. “The Centre for infection and immunity (CII) has been committed to ME/CFS research since 2010. “Nearly every patient with Myalgic Encephalomyelitis thinks of suicide at one time or another, but rarely can the impulse be blamed exclusively on the physical pain and disability. I have discovered that most people learn to tolerate those things, particularly the tough breed of people who live out in the country. It’s an unfortunate fact that our culture has yet to accept the harsh reality of chronic disease; often, its ravages are invisible to the naked eye. But ME carries a terrible stigma, the burden of which weighs more heavily on them even than the burdens borne by most victims of chronic disease. The world seems to believe that people with Myalgic Encephalomyelitis – a population the general medical profession has yet to stamp with its imprimatur of “bona fide” – could “snap out of it” if they really wanted to. Please consider raising awareness by sharing these images and quotes about Chronic Fatigue Syndrome / Myalgic Encephelomyelitis on social media. You will find share buttons to the left of the screen and below. In particular, the following dates are set aside for #MEAwareness. 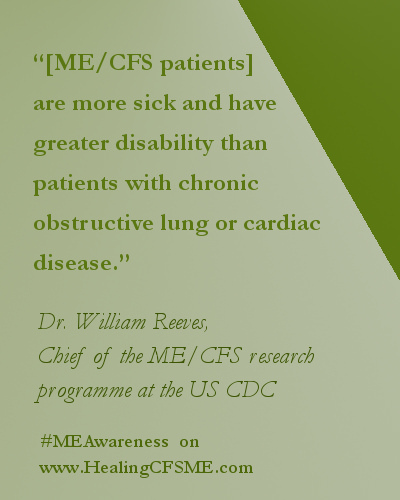 ME Awareness month is in May each year. International ME Awareness day is May 12th. Severe ME Awareness Day is on August 8th and is also a day of remembrance for those who have died from Myalgic Encephalomyelitis, including those who have committed suicide as a result of living with the illness. Katherine T Owen runs this website - www.HealingCFSME.com. For more images and quotes about Chronic Fatigue Syndrome / Myalgic Encephalomyelitis move to read an article on CFS Research. One of the aims of this healing website is to give you hope by sharing articles about learning to cope and find a BIGGER life even with chronic illness. Is your level of health being doubted by someone important to you? If so, you have my sympathy. I know how hard that is. Move to read an article to cultivate positive self talk to help you cope with disbelief.